The Beocord 8900 V was not sold in the UK due to the absence of stereo TV broadcasts at the time and the rarity of stereo pre-recorded V2000 format tapes. In those European countries that had a stereo TV service (e.g. Germany) it was sold along side the Beovision 8900, the first stereo Beovision model. Text copyright © Beocentral. Unauthorised reproduction prohibited. The Beocord 8900 V could make stereo recordings from suitable TV broadcasts because an A2 (Zweiton) decoder was built in. The tape format was two linear tracks, which due to the already congested double-sided layout of the V2000 tape made them very narrow indeed. To allow stereo playback through the TV loudspeakers a DIN AV socket was fitted, which carried video, stereo audio and basic control signals between the VTR and TV set. An extra stereo audio output was also fitted for use with an audio system; this was useful if the recorder was to be used with a mono television. The stereo recording system had only one extra control that selected either the original or the dubbed soundtrack on specially prepared films. A small green light was fitted next to the channel display to show when a stereo TV broadcast was being received. Text copyright © Beocentral. Unauthorised reproduction prohibited. In all other respects the Beocord 8900 V was similar to the Beocord 8802 V so it therefore included the digital version of the Philips “dynamic track following” system that allowed for freeze frame and slow motion modes. 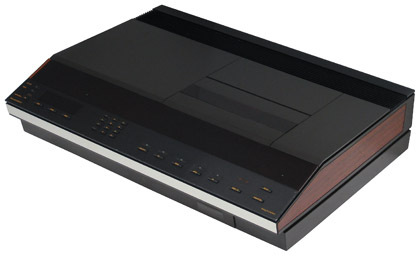 In the following years the VHS system would establish itself as the standard format for video recorders and the Beocord VHS 80 would be offered with a similar stereo linear recording system. Text copyright © Beocentral. Unauthorised reproduction prohibited.